Many consider For Whom the Bell Tolls to be author Ernest Hemingway’s finest work. Inspired by Hemingway’s time as a war correspondent for The North American Newspaper Alliance during the Spanish Civil War, For Whom the Bell Tolls is a stark and brutal commentary on the nature of war, sacrifice, and death. In fact, many believe his work is among the best depictions of the Spanish Civil War written. As with some of Hemingway’s other work, many of the characters, experiences, and events were based off real people and battles Hemingway saw. One of the most interesting qualities of For Whom the Bell Tolls is the use and restraint of profanity. Even though Hemingway had already written much about war and tribulations and had never seemed inclined to limit the use of vulgar language, For Whom the Bell Tolls is a clear exemption. When writing dialogue, Hemingway would insert the word “obscenity” instead of writing the exact word or phrase. There has been a lot of discussion about the reason for such omissions, and while some believe Hemingway was worried about the book being banned and thus wanted to make the book as reader-friendly as possible for a brutally violent war novel, others believe the omissions of profanity was due to transliteration problems and the author’s attempt to be as honest to the dialogue he heard as possible. There is no arguing with the legacy and influence Hemingway had not only on American culture, but also on generations of future writers. The Beatnik generation referred to Hemingway as “Papa” with a quite reverence, and Hemingway inspired countless journalists with his in-depth profiles and wartime articles. Even the cities where he wrote his books are now places for pilgrimage among his most devoted fans. Hemingway first started writing For Whom the Bell Tolls in Cuba and later finished it in Sun Valley, Idaho. In fact, both hotel rooms are now popular tourist destinations. Published in 1940 by Charles Scribner in an initial print run of 75,000 copies at $2.75, a first printing of For Whom the Bell Tolls has the letter A present on the copyright page and may have the Scribner's seal present, although it hasn't been conclusively determined whether this is in fact a point of issue. First state dust jackets do not have a photo credit under the photograph of Hemingway. Scribner, 1940 First Edition, First Printing SIGNED and INSCRIBED by Ernest Hemingway This original sophisticated dustjacket is vibrant in color with NO chips or tears. This First Issue dustjacket, without the photographer's name, has the printed $2.75 price present. The book is in excellent condition with minor wear to the edges. The binding is tight, and the boards are crisp. The pages are exceptionally clean with NO marks or bookplates in the book. Overall, a superb copy of this TRUE FIRST EDITION, with the Scribner's "A" printed on the copyright page, SIGNED by the author. Includes a custom clamshell slipcase to protect the book. We buy SIGNED Hemingway First Editions.. Signed by Author(s). 1st Edition. Hardcover. Fine/Fine. Charles Scribner's Sons, New York, 1940 First Edition, First Printing SIGNED by Ernest Hemingway. This original dustjacket has the printed $2.75 price present with minor wear to the edges. The book is bound in the publisher's ORIGINAL cloth and is in excellent condition. The binding is tight with NO cocking or leaning with slight wear to the spine. The pages are clean with NO marks or bookplates in the book. A wonderful copy of this TRUE FIRST EDITION SIGNED by the author.. Signed by Author(s). 1st Edition. Hardcover. Fine/Fine. For Whom the Bell Tolls. New York: Charles Scribner's Sons,, 1940. Octavo. Original beige cloth, titles to spine in black and red, and to front board in black, top edge brown. With a supplied dust jacket. Housed in black quarter morocco solander box by the Chelsea Bindery. Gift inscription to front free endpaper. Contents toned, spine cocked and rubbed, cloth somewhat marked, a very good copy, dust jacket creased and rubbed at edges and folds, chips to spine ends and tips, slight loss to head of spine, short closed tear to First edition, first printing, presentation copy, inscribed by the author to the famously eccentric Sir Archibald Clark Kerr on the front free endpaper, "For Sir Archibald Clark Kerr wishing him all good things all his life from his friend Ernest Hemingway Rangoon April 21 - 1941". Kerr was the Australian-born British diplomat who was, at the time of the inscription, British Ambassador to China. On meeting Hemingway, Kerr is reported to have said of him, "Tough? Why, I'm tougher than he is!" Kerr would subsequently go on to become Ambassador to Moscow and then to Washington; he was present at all of the Big Three conferences. Scribner's, 1940 A near fine first edition (with Scribner's A on the copyright page) in a good first issue dust jacket (no reference to photographer on back panel), inscribed by the author Ernest Hemingway in Cuba on the front free endpaper. Housed in a custom-made collector's clamshell case with a leather spine.. Inscribed by Author(s). 1st Edition. Hardcover. Near Fine/Good. Charles Scribner's Sons, 1940. First edition, first printing. Very slight toning, still fine in near fine, faintly rubbed, price clipped dust jacket with two small chips expertly restored at head of spine, in mylar cover. A very handsome copy. In first issue dust jacket with no photographer's name on rear panel. Signed by the author. Edition: First edition, first printing. Scribner's, 1940 A fine first edition (with Scribner's A on the copyright page) in a very good first issue dust jacket (no reference to photographer on back panel), signed by the author Ernest Hemingway on a blank page after the front free endpaper. Housed in a custom-made collector's slip0case.. Signed by Author(s). 1st Edition. Hardcover. Fine/Very Good. Scribner's, 1940 A fine first edition (with Scribner's A on the copyright page) rebound in leather, inscribed by the author Ernest Hemingway on the dedication page. Housed in a custom-made collector's clamshell case with a leather spine.. Inscribed by Author(s). 1st Edition. Hardcover. Fine/No Jacket. New York: Charles Scribner's Sons, 1940. First edition, early printing of the novel that is regarded as one of Hemingway's best works. Octavo, original cloth. Signed by Ernest Hemingway on the page following the front free endpaper. Fine in a excellent near fine dust jacket with a few small closed tears. Housed in a custom half morocco clamshell box. Rare and desirable signed by Hemingway. For Whom the Bell Tolls combines two of Hemingway's recurring obsessions: war and personal honor. "This is the best book Ernest Hemingway has written, the fullest, the deepest, the truest. It will, I think, be one of the major novels of American literature Hemingway has struck universal chords, and he has struck them vibrantly" (J. Donald Adams). It was the basis for the 1943 film directed by Sam Wood, starring Gary Cooper and Ingrid Bergman. It was nominated for nine Academy Awards, including Best Picture, Best Actor and Best Actress; however, only the Greek actress Katina Paxinou won an Oscar for her portrayal of Pilar. Charles Scribner's Sons, New York, 1940 First Edition, First Printing with the publisher's "A" printed on the copyright page. This ORIGINAL First Issue dustjacket without the photographer's name on the back panel is vibrant in color with minor repair. The book is in great shape with slight wear to the edges. The book is bound in the ORIGINAL publisher's tan cloth with the red spine label. The pages are clean with NO writing, marks or bookplates in the book. A superb copy of this TRUE FIRST EDITION.. 1st Edition. Hardcover. Fine/Fine. Scribners, 1940. Hardcover. Good. A first US edition, first printing (with A on copyright page; in first state dust jacket), inscribed by Ernest Hemingway on title page to his friend (Cheveendo P.(? )), from San Francisco de Paula, Cuba in 1952. The book is in good condition with some rubbing and fading along spine an a circular stain on back cover - one previous owner's book plate on the front endpaper. The book comes with original first state dust jacket (unclipped with original $2.75 price), in good condition with some chipping. A very rare copy of one of the most seminal works of the twentieth century. New York: Chas. Scribner's Sons, 1940. Cloth. Spine somewhat rubbed and darkened, a bit tanned and a trifle shaken, but a sound copy. Later printing of the first edition (without the 'A'). Inscribed by Hemingway on the half- title: "To Max Showalter with all good wishes Ernest Hemingway." Accompanied by two other items: a) another copy, first printing, bearing Max Showalter's ownership signature on the free endsheet (endsheets darkened at gutters, else very good, in defective, but largely complete, dust jacket); and b) Mary Hemingway's HOW IT WAS (New York: Knopf, 1976), first edition, near fine in very good dust jacket, inscribed by Mary Hemingway to Showalter in Los Angeles in the year of publication. Showalter (a.k.a. Casey Adams) enjoyed a long career in film and television, and was a feature player at 20th Century Fox favored by Darryl Zanuck, who required Showalter's assumption of the 'Adams' stage name. Though he was associated with a long list of films and television programs from the 1940s-1980s, we find no record of his credited association with a film adaptation of Hemingway's work. He did, however, originate the role of Ward Cleaver (the Beaver's old man), which later passed to Hugh Beaumont. Scribner's, 1940 First Edition, First Printing with the Scribner's "A" printed on the copyright page. A Fabulous copy seldom seen in this nice condition. This ORIGINAL unsophisticated dustjacket is rich in color without the common fading to the spine. This First Issue dustjacket, without the photographer's name on the back panel has the $2.75 printed price present. The book is in great shape. The binding is tight and the boards are crisp with slight wear to the edges. The pages are clean with NO writing, marks or bookplates in the book. Overall, a stunning copy of this TRUE FIRST EDITION housed in a custom clamshell slipcase for preservation and presentation.. 1st Edition. Hardcover. Fine/Fine. New York: Charles Scribner's Sons, 1955. Hardcover. Near Fine/Very Good+. Inscribed by Hemingway to his very close friend and fishing buddy, Charles Thompson: "For Lorine and Charles with love from Ernest. Sept. 20, 1957." Near fine copy in sun-tanned dust jacket, chipped at the head. A choice association copy of one of Hemingway's most enduring works. The decade or so that Hemingway lived in Key West were among his most productive years as a writer. He wrote in the mornings, fished in the afternoons, and often spent his evenings drinking with friends. One of those friends, many say his best friend, was Charles Thompson, the owner of a marine hardware store and a couple of other businesses. Charles went on an African safari with Ernest, and the character "Old Karl" in ''The Green Hills of Africa'' is based on him. There is also a lot of Charles Thompson in the character Harry Morgan in the novel "To Have and Have Not." Charles Scribner's Sons, 1940 First Edition, First Printing. This original dustjacket is vibrant in color and has benefitted from some professional restoration. The end result is a beautiful dustjacket with no chips or tears. The book is in excellent shape. The binding is tight, and the pages are clean, with no writing, marks or bookplates in the book. An impressive first state book with the Scribner's "A" on the copyright page with light wear to the edges. A lovely copy in collector's condition!!!. 1st Edition. Hardcover. As New/As New. Charles Scribner's Sons, New York, 1940 First Edition, First Printing. A beautiful copy. This ORIGINAL sophisticated dustjacket is rich in color with NO chips or tears. This First Issue dustjacket with NO photographer's credit to the back panel of the dustjacket has has the $2.75 printed price present. The book is in excellent condition. The binding is tight and the boards are crisp with a hint of wear to the edges. A superb copy of this TRUE FIRST EDITION housed in a custom clamshell slipcase for preservation.. 1st Edition. Hardcover. Fine/Fine. New York: Charles Scribner's Sons, 1940. First edition. Near Fine/Near Fine. A Nearly Fine copy of the book with offsetting to the end-papers (from publishers glue as usual) and slight off-set to the half-title. In a beautiful Nearly Fine dust jacket that is price clipped and shows a trivial nicks and rubs near the spine, but without chips, tears or fading. A book that is extremely difficult to find in this condition. Hemingway's captivating story of an American demolitions expert joining a band of rebels during the Spanish Civil War. Based in part on Hemingway's first-hand experiences in Spain during the 1936 - 1939 civil war. "'For Whom the Bell Tolls' is a tremendous piece of work. It is the most moving document to date on the Spanish Civil War, and the first major novel of the Second World War." (Contemporary NY Times Book Review). Near Fine in Near Fine dust jacket. Scribner, Scribner(s), 1940 First Edition, First Printing with the Scribner's "A" printed on the copyright page. An attractive FIRST ISSUE DUSTJACKET WITHOUT THE PHOTOGRAPHER'S NAME PRINTED ON THE BACK PANEL of the dustjacket that has the $2.75 price present on the front flap with wear to top spine and edges. This original dustjacket is vibrant in color without the ubquitous fading to the spine found on most copies. The book is in excellent shape. The binding is tight, and the boards are fresh with slight wear to the panels. The pages are exceptionally clean with no writing, marks or bookplates in the book. Overall, a sharp clean copy of this TRUE FIRST EDITION in collector's condition.. 1st Edition. Hardcover. Fine/Near Fine. Charles Scribner's & Sons, New York, 1940 First Edition, First Printing with the publisher's "A" printed on the copyright page. A wonderful copy. This First Issue dustjacket has the printed price present with minor wear to the spine and edges. The book is in great shape. The binding is tight and the boards are crisp with a hint of wear to the edges. The pages are clean. There is NO writing, marks or bookplates in the book. Overall, a lovely copy of this TRUE FIRST EDITION housed in a beautiful custom clamshell slipcase.. 1st Edition. Hardcover. Fine/Near Fine. Charles Scribner's Sons, New York, 1940 First Edition, First Printing with the "A" printed on the copyright page. An attractive dustjacket that has light restoration to the spine and edges. This original First State dustjacket without photographer's credit on back panel has NO chips or tears. The book is in wonderful condition. The binding is tight, with slight wear to the panels. The pages are clean with NO writing, marks or bookplates in the book. Overall, a collectable copy of this TRUE FIRST EDITION housed in a beautiful clamshell slipcase.. 1st Edition. Hardcover. Near Fine/Near Fine. Charles Scribner's Sons, New York, 1940 First Edition, First Printing with the Scribner's "A" printed on the copyright page. This ORIGINAL dustjacket is rich in color with minor wear to the spine and edges. This First Issue dustjacket without the photographer's credit on the back panel has the publisher's $2.75 printed price present. The book is in wonderful shape. The binding is tight with light wear to the edges. Overall, a sharp copy of this TRUE FIRST EDITION with an acetate cover to protect the dustjacket.. 1st Edition. Hardcover. Fine/Near Fine. New York: Charles Scribner's Sons, 1940. First edition with the Scribners A of the novel that is regarded as one of Hemingway's best works. Octavo, original beige cloth. Fine in a near fine first issue dust jacket without the photographer's name on the rear panel, with a touch of rubbing and a closed tear to the rear panel. A very nice example. For Whom the Bell Tolls combines two of Hemingway's recurring obsessions: war and personal honor. "This is the best book Ernest Hemingway has written, the fullest, the deepest, the truest. It will, I think, be one of the major novels of American literature Hemingway has struck universal chords, and he has struck them vibrantly" (J. Donald Adams). It was the basis for the 1943 film directed by Sam Wood, starring Gary Cooper and Ingrid Bergman. It was nominated for nine Academy Awards, including Best Picture, Best Actor and Best Actress; however, only the Greek actress Katina Paxinou won an Oscar for her portrayal of Pilar. New York: Charles Scribner's Sons, 1940 First edition, first printing, in the first state dust jacket lacking photographer's credit to rear panel (which was added in later states). Publisher's beige cloth, stamped to front board in black with author's facsimile signature, stamped in red and black to spine; in the original black, red, white, and blue dust jacket with a photographic portrait of the author to the rear panel. About fine with a touch of toning to page edges and faint offsetting to endpapers; in a very good or better dust jacket, unclipped, with some wear to extremities, shallow chipping to spine ends, short closed tears to bottom edge of front panel, one-inch closed tear to top edge of front panel near spine head, and to top and bottom edges of rear panel about an inch from the spine. Overall, a bright copy that presents very well in the original first state dust jacket, much nicer than usual. Hanneman A18a. For Whom the Bell Tolls is Hemingway's account of the Spanish Civil War, based on his experiences living as a journalist in Spain during the conflict. It tells the story of protagonist Robert Johnson, an American fighting for the republicans during the war. Notably, For Whom the Bell Tolls describes the struggle of the Spanish people without glorifying the war effort. Along with The Sun Also Rises, The Old Man and the Sea, and A Farewell to Arms, this text is considered one of the author's best novels. Indeed, in his 1940 New York Times review, Ralph Thompson praises it as "the most moving document to date on the Spanish Civil War," "the first major novel of the Second World War," and even Hemingway's "finest novel." 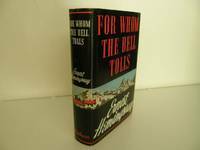 At 211,000 words, For Whom the Bell Tolls is also Hemingway's longest text.. First Edition.. Hard Cover. Fine/Dust Jacket Included. New York, Scribner, 1940. First Edition. Finely bound in modern aniline calf over marble boards. Raised bands with the title blocked direct in gilt. An exceptional copy - scans and additional bibliographic detail on request. ; 471 pages; Description: 471 p. 22 cm. Subjects: Americans --Spain --Fiction. Spain --History --Civil War, 1936-1939 --Fiction. References: Johnson, M. De V. First editions (4th ed. ) , p. 236. First printings of Amer. Authors, v. 1, p. 179. With Scribner's indicative 'A' to the colophon..
NEW YORK: CHARLES SCRIBNERâS SONS, 1940. 1ST EDITION. HARDCOVER. VERY GOOD/VERY GOOD. NEW YORK: CHARLES SCRIBNERâS SONS, 1940. 1ST EDITION. VERY GOOD/VERY GOOD. Charles Scribner's Sons, New York, 1940. Hardcover. VG+ book in a VG+ jacket, with the Scribner's "A" printed on the copyright page, 1st Edition, not remaindered, bookclub or library, unmarked, mylar cover, handsome collectible edition. Scribner's, 1940 First Edition, First Printing with the Scribner's "A" printed on the copyright page. This First Issue dustjacket with NO photographer's credit to the back panel of the dustjacket is rich in color with light wear to the spine and edges. This ORIGINAL dustjacket has the $2.75 printed price present. The book is in wonderful shape. The binding is tight with minor wear to the edges. Overall, a sharp copy of this TRUE FIRST EDITION with an acetate cover to protect the dustjacket. We buy Hemingway First Editions.. 1st Edition. Hardcover. Near Fine/Near Fine. New York: Charles Scribner's Sons. 1940. First Edition; First Printing. Hardcover. Very Good+ in a Very Good+ dust jacket. Few closed tears throughout jacket. Chipping at top of front/rear panels and spine crown. Lightly toned throughout. This First Issue dustjacket, without the photographer's name, . New York: Charles Scribner's Sons, , 1940. Rilegato tela, sovracoperta (cloth, dust jacket). Molto Buono (Very Good). Prima edizione siglata con la lettera "A" dell'editore al colophon, completo della sovraccoperta in prima tiratura che non accreditava il nome del fotografo per il ritratto di Hemingway sul retro / First edition, first printing, with the Scribner's "A" to colophon, and in the first issue jacket without the photographer's credit . 8vo. pp. 472. Molto Buono (Very Good). Sovracoperta restaurata professionalmente (Dust jacket professionally restored). Prima edizione (First Edition, first printing). First printing with Scribner's "A" on the copyright page, in a first issue dust jacket, without the photographer's credit on the rear panel. The book is fine, appearing unread. The dust jacket is near fine, uncommonly bright. Some very slight loss to the top of the spine, and a noticeable chip to the top right of the rear panel. Little hints of wear and tear, mostly closed and shallow, and far less than usually seen. A beautiful copy. HEMINGWAY, Ernest. For Whom the Bell Tolls. Orig. cloth in dust jacket. New York: Scribner's, 1940. 8vo. First edition. While this is one of the more common Hemingway novels, published in a large first printing, the prices for this title have risen dramatically in recent years. A fine copy in very good first issue dust jacket with minor chipping to head and foot of spine and corners. New York, Scribner's Sons, 1940. Original grey cloth with red title-label to spine and "Ernest Hemingway" to front board + original printed dust-jacket. Internally very nice, clean and fresh. Dust-jacket with a few nicks and tears to extremities and price-clipped (completely unsophisticated). Overall in very nice condition. ¶ First Edition, First Printing (with the Scribner's "A" on copyright page), in first issue dust-jacket (without the photographer's name underneath the portrait on the back) of one of Hemingway'sgreatest novels. The First USA printing published by Charles Scribner's Sons, New York in 1940. The correct First Issue with 'A' to the copyright page. The BOOK is in near Fine condition with just a hint of rubbing to the red colouring on the spine. Interestingly this copy has virtually no toning of the spine which is usually encountered. Mild offsetting to the end papers. Free from inscriptions and erasures. The WRAPPER is complete and is in Very Good+ condition. It is is the correct First Issue with no photographer's name to the rear cover and it bears the correct price of $2.75 to the upper front flap. Mild edge-wear with some loss at the rear cover lower edge and the upper spine end. Unusually, there is No fading of the red colouring to the spine. The wrapper looks very striking in the the removable Brodart archival cover. The 4 page review from 'The October Book-of-the-Month Club' has been tipped in (as suggested in the review) to the front blank end paper. One of the major novels by the Nobel Laureate of American literature. It was the basis for the 1943 film directed by Sam Wood, starring Gary Cooper and Ingrid Bergman. It was nominated for nine Academy Awards, including Best Picture, Best Actor and Best Actress; however, only the Greek actress Katina Paxinou won an Oscar for her portrayal of Pilar. A collectible copy in such condition. Ashton Rare Books welcomes direct contact. New York: Scribners, 1940 First Edition. First state with photographer's name missing from back panel of dustwrapper. Scribner's "A" on copyright page. 8vo. Buckram stamped in red and black. 471 pages. Top page edges stained brown. Endpapers are a little browned in fold. Tight. Clean. Dust jacket has an eighth inch chip missing at base of spine. Small chips at several corners. Top edge is chipped. Very good/ Very good condition..
SCRIBNERS, 1940. A NEAR FINE FIRST IN FIRST ISSUE dj,. FIRST ISSUE publisher's "A" on copyright page. dj tape reinforced. not restored. First edition points of issue present: rear jacket photograph uncredited. Price ($2.75). FIRST. Hardcover. /Fine. Book. New York: Charles Scribners, 1940. A handsome copy of this First Edition/First Printing with the Scribner's "A" on copyright page. Pastedowns and endpapers slightly discolored but excellent overall condition. Hemingway's great novel of the Spanish Civil War focuses on a small band of brave Spanish women and men, risking their lives to carry out the explosion of a For Whom the Bell Tolls has been called Hemingway's most ambitious novel, and it is the one in which his political convictions reveal themselves most fully: he effectively conveys the idea that a people's freedom is worth fighting, and even dying, for. Clean and tight. 1st Printing. Cloth. Very Good+/No Jacket. 8vo - over 7¾" - 9¾" tall. New York: Charles Scribner's Sons, 1940. 471pp. First edition later printing. Hemingway's great novel of the Spanish Civil War focuses on a small band of brave Spanish women and men, risking their lives to carry out the explosion of a bridge. American Robert Jordan is there to join their dangerous mission, and in doing so, falls in love with a beautiful Spanish girl Maria. DJ chipped. Text clean. . First Edition. Cloth. Near Fine/Very Good+. 8vo - over 7¾" - 9¾" tall. MacMillan & Co Ltd. MASS MARKET PAPERBACK. B000I34KCI Good Condition. Tear on cover. Five star seller - Buy with confidence! . Good. New York: Charles Scribner's Sons, 1940. First Edition. Near Fine/Very Good+. First edition, first printing, with an "A" on the copyright page. In publisher's buff cloth, stamped in black and red. Near Fine, offsetting from binder's glue to endsheets, previous owner name to front paste down, and light toning to pages, else a very sharp copy. In a Very Good first issue dust jacket with $2.75 intact and lacking publisher's credit on rear panel; a bit edge-tattered, though still in much nicer condition than usually encountered. A nice copy. New York: Charles Scribner's Sons, 1940. First edition with the Scribners A of the novel that is regarded as one of Hemingway's best works. Octavo, original beige cloth. Fine in a very good first issue dust jacket without the photographer's name on the rear panel, with some rubbing and wear to the extremities. For Whom the Bell Tolls combines two of Hemingway's recurring obsessions: war and personal honor. "This is the best book Ernest Hemingway has written, the fullest, the deepest, the truest. It will, I think, be one of the major novels of American literature Hemingway has struck universal chords, and he has struck them vibrantly" (J. Donald Adams). It was the basis for the 1943 film directed by Sam Wood, starring Gary Cooper and Ingrid Bergman. It was nominated for nine Academy Awards, including Best Picture, Best Actor and Best Actress; however, only the Greek actress Katina Paxinou won an Oscar for her portrayal of Pilar. Charles Scribner's Sons, 1940-01-01. Scribner edition. Paperback. Used:Good. New York: Scribner, 1940. hardcover. fine. 471 pages. Thick 8vo, handsomely rebound in half brown morocco over marbled boards; gilt-ruled and lettered spine with raised bands. New York: Scribner's, 1940. First Edition. A fine copy. Charles Scribners Sons, New York, 1935 First Edition, First Printing with the publisher's "A" printed on the copyright page. This ORIGINAL second issue dustjacket has the publisher's $2.75 printed price present on the front flap with minor wear to the spine and edges. The book is in great shape. The binding is tight with minor wear to the boards. The pages are clean with with NO writing, marks or bookplates in the book. A lovely copy in collector's condition.. 1st Edition. Hardcover. Fine/Near Fine. Charles Scribner's Sons, 1940 Published in New York by Charles Scribner's Sons in 1940. First issue, A on copyright page, no photographer name on back. Book very good, staining on front board, front paste down, and front free endpages; spine darkened. DJ very good, rubbing on front cover, chipping on top and bottom of spine and both flap hinges, .5" tear at bottom of back cover which has been repaired on the reverse side with clear adhesive tape, small tears at top of spine which have been repaired on the reverse side with clear adhesive tape, some chipping and small tears along top of front cover. DJ price reads "2.75.". 1st Edition. Hardcover. Very Good/Very Good. New York: Scribner's, 1940. First edition. Good. First edition points of issue present: rear jacket photograph uncredited. Price ($2.75) present on front flap. Dust jacket rather chipped and frayed, with some loss at head. Endleaves discolored and stock lightly and evenly toned. Structurally sound with no marks or blemishes. New York: Scribners, 1940. A First Edition, First Printing. Hardcover. Fine. A fine copy handsomely rebound in full burgundy morocco. Hemingway's facsimile signature in gilt on front board, six gilt decorated spine compartments, marbled endpapers, top edge gilt. Scribner's "A" on copyright page, volume appears unread. A beautiful copy. New York: Scribners, 1940. A First Edition, First Printing. Hardcover. Near Fine. Pages just slightly toned, else near fine, finely bound in recent full dark black morocco, raised bands with gilt title and decorations on spine. The spine and front board from the original binding bound in at the rear. A very nice copy of this first edition, in a very handsome binding. New York: Charles Scribner's Sons. 1940. First Edition; First Printing. Hardcover. Very Good+ in a Very Good dust jacket. First Edition. Includes Scribner "A" to copyright page. $2.75 price stated to dust jacket. 1st issue does not have a photo credit under the photograph of Hemingway. Toning to pages. Chps to crown and heel. Creasing to upper rear panel. ; 8vo 8" - 9" tall; Original unclipped dust jacket protected by archival Brodart cover. All domestic orders shipped protected in a Box. .
New York: Charles Scribner's Sons, 1940 Book. Very Good. Hardcover. 1st Edition. Same date to title and copyright pages. VG/none. Oatmeal colored/textured boards with imprint of Ernest Hemingway's signature on front cover. First flyleaf partially torn away. Clean, no marks, tight edition. Black title on spine is clear, red background a bit worn..
Charles Scribners & Sons. HBDJ, ( 1st Edition, 1st State ) 1940, WITH A on copyright pg, PC But orig price shows, DJ has numerous Pieces Missing primarily near front edge & down edge & Bottom Spine, But Title & Authors Name ar e Barely Affected by missing pieces, Creases DJ & Some Wear,Original Beige Cloth with red & black on Spine, 471 pgs, interior Nice, Tight Clean only Slight Darkening, Photograph of author on Back DJ i ntact with small piece missing & wear, VG-/.